Why do we still use cash? With all the tools provided by digital technology, why do we remain so attached to germ-covered, hard-to-transport, easy-to-steal bits of metal and paper? That’s one of the questions author David Wolman tackles in his book, “The End of Money.” Intrigued by the possibility that cash could soon disappear, he set out to investigate the future of money – starting with a decision to shun cash for an entire year. In the process, he talked with a convicted counterfeiter, obsessive coin collectors, digital money gurus and residents of Delhi’s slums – people whose experiences and needs illuminate the forces that could be driving us toward a cashless future. Wolman, a contributing editor at Wired, talked with NextBillion Financial Innovation recently about what a cashless world might look like, who the winners and losers might be, and why we still cling to our old-fashioned coins and bills. James Militzer: What inspired you to write about the “End of Money”? David Wolman: It all started with a short essay I wrote for Wired several years ago highlighting some of the downsides of physical currency and proposing that we get rid of it. The response was overwhelming–and more than a little hostile. I had struck a nerve. Separate from the issue of whether killing cash is good or bad (or both), I was surprised by the emotional intensity of these responses, how out of synch they are with the fact that most money today is already electronic. So I decided to delve into this question of our relationship to tactile money, and the broader story of money’s past, present and future. JM: What are the main reasons we still use cash, and what are the main pressures that are pushing us away from it? DW: There all kinds of reasons people use cash. They are old-fashioned, maybe. Or they are desperate for a treat from a vending machine, feeling the urge at a garage sale, or stopping at a kid’s lemonade stand. Or they’re criminals. Some people find that they spend less when they limit themselves to using cash. Others worry about banks, advertisers and governments prying into their financial lives. But far and away the biggest reason people use cash is because they have no other option. I’m talking about the 2-point-whatever billion people on the planet subsisting on two bucks a day, plus hundreds of millions of others who might be marginally better off, but still don’t have access to financial services. They are excluded from the formal economy, which means cash is pretty much the only form of money available to them. The sometimes-lopsided economics of cash, particularly small-denomination coins, have come under scrutiny in recent years, and this has led some countries to simply stop issuing them. In other settings, the costs of dealing with cash don’t make sense, hence the cashless cabin policy of many airlines, for instance. Yet I don’t think such pressures pushing us away from cash are as pronounced as those pulling us away from it. In a word: technology. Why would you go to a bank or ATM if you don’t have to? JM: How would life be different in a cashless society – what current problems might cease to exist (or take new forms), and what new problems might arise? Who would be the biggest winners/losers? DW: Massive question! Here are a couple of quick-hit ideas, but really, for a more thorough answer, I could point you toward a book on the subject. (Ahem.) To get the conversation rolling, though, killing cash, or even just the high-value bills, would help to reduce crime. Bank robberies–done. (There were 10,000 of them during the two years that I wrote the book.) Muggings, stick-ups at the local grocery–kaput. US Secret Service agents would never again have to chase down meth addicts who try to pass bogus twenty-dollar bills made on a desktop color printer. I’m not naïve enough to think that crime would be eliminated. Of course not. Financial crime is doing just fine in cyberspace, thank you very much. But imagine what it would mean if law enforcement–at whatever level–didn’t have to deal with cash, cash crimes, or criminal activity made easier by the remarkably convenient, universally accepted and completely anonymous US hundred-dollar bill. Also, killing cash could be enormously beneficial for international development, provided we have alternatives in place. It would make it easier to distribute aid and benefits, and would make it easier for governments to discover and weed out corruption and crime. The flip side is that it could make it easier for governments to snoop on citizens or even confiscate wealth. And one huge problem that could arise is a power outage that lasts for weeks or months. As for who would win in this imagined cashless future: taxpayers and the poor, primarily. For those of us who are better off, life wouldn’t be that different. Think about it: When was the last time you used a sizable amount of cash for something that wasn’t purely for leisure? For the poor, though, alternatives to cash will help in the quest to achieve more stable financial footing. JM: Do you envision the world fully transitioning to a cashless system, and if so, when? How is such a transition most likely to happen – ie: country by country over the course of years/decades, or relatively quickly? DW: I don’t see it happening in the near future, but I think anyone trying to predict beyond, say, 20-25 years is sort of a clown. We just don’t know what will be possible. Look at this technology, for instance. Anyway, it won’t be a country-by-country thing, and it definitely shouldn’t be a government edict. The way I think about it is that cash’s fate will, or could, closely track that of the pay phone. JM: Your book mentions “how cash penalizes the poor more than anyone—and how mobile technologies promise to change that.” Can you briefly explain what you mean by that? DW: I already touched on cash’s cost for those who can least afford it, so let’s get to the promise part. In many developing countries, as I’m sure NextBillion readers are aware, people are already using mobile technology to store and transfer money more safely and easily than they have ever done before. No more daylong bus rides just to give grandma $5 for groceries. These small amounts of money are less vulnerable to theft, a smooth-talking friend, or graft. At the same time, aid can actually be distributed directly to those in need without traveling through layers of questionable bureaucracy. In the same way that mobile technologies won’t end poverty, mobile money and mobile banking apps won’t either. But they are going to be crucial when it comes to establishing more financial security and access to financial services, which many people far smarter than me assert are essential for climbing permanently out of poverty. JM: Is there anything that could/should be done to help the poor and unbanked navigate the transition to a cashless world? DW: We need to think much bigger than that. 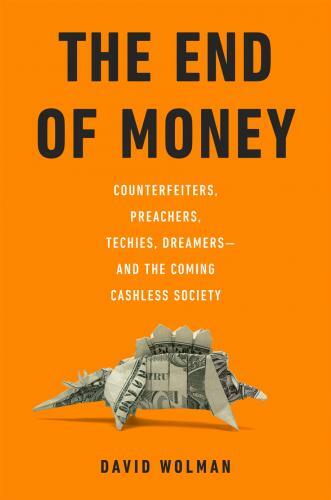 Yes, “cashless society” is a provocative term, especially in the media or on a book jacket. But marginalization of cash is really only a byproduct of technological, social and economic trends. Whether it’s ever completely gone matters a lot less than the impact these changes could have on people’s livelihoods. As for maximizing the benefit of the digital money future for the masses, the key is developing a more sophisticated understanding of money’s multiple functions–medium of exchange, standard unit of account, store of value, etc.–and a recognition that there are different forms of money, and that one form that is preferable in one circumstance may not at all be optimal in other circumstances. Providing some political stability would be nice, too. JM: What would a cashless society mean for financial institutions? DW: Financial institutions will have to become more nimble. I think we will see startups taking on today’s giants. Think of PayPal and, more recently, Square or M-Pesa, but with a faster rate of upstarts grabbing market share from the big dogs. I would also love to see a kind of privacy arms race, with companies vying to provide the best assurance of privacy, but that’s just me. JM: You’ve written about the emotional attachment many people (yourself included) have to cash. Do you think emotional factors will outweigh other, more practical, factors and prevent us from abandoning cash? DW: Yes. For a while. But not forever.